Radio broadcaster Paul Harvey popularized “The Rest of the Story.” Now, some PACS manufacturers have decided that oncology practitioners would also benefit from a more complete story. So-called oncology PACS are designed to provide oncology teams with imaging and clinical data organized the way they need them. “In radiology, a physician will usually have one encounter with a patient, make his report, then store the data for future use. In oncology, a physician—typically several physicians—will have many encounters with the patient over a 30- to 40-day period of treatment, and images are involved at many points in time,” says Erwin Nell, systems marketing manager for Palo Alto, Calif.-based Varian Medical Systems. To address those differences, Varian developed a PACS solution for oncology imaging. 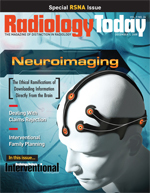 “There might be diagnostic CT, PET, and MRI images; CT and other images for treatment planning; and positioning images taken just before each daily treatment. Some of these images lead to plans being adjusted and changed over the course of treatment. There is a large magnitude of images and related information that needs to be stored and, more importantly, clinicians need a way to view it in a comprehensive manner,” Nell adds. Varian designed its oncology PACS to enable practitioners to view oncology patient data showing an accurate, contextual relationship between the patient and procedure at every phase of cancer treatment, according to Nell. From initial diagnosis to response, the oncology PACS is designed to support workflow specific to oncology and integrates image viewing. Varian realized that many hospitals had already invested in a PACS, so it did not focus on filling that space with a new oncology-specific solution. “We came up with a way to add something that makes the existing PACS ‘oncology capable,’ where a facility can use the existing PACS as storage but then link to the existing PACS with our system and use it to make sense of the information by adding logic, communication, and viewing layers. This provides the type of information that an oncologist could later mine and use to enhance patient care,” says Nell. Varian also offers a stand-alone oncology PACS model for facilities that haven’t yet made an investment in the technology. To achieve an improved workflow in oncology, DICOM objects need to be stored for a particular study in addition to treatment records and other data; however, many PACS that are currently in use don’t support this type of storage and retrieval. Many RIS are not scalable, so the technology often prohibits practitioners from adding treatment plans along with images, which, according to Nell, is the fundamental difference from using a traditional PACS. These units are often limited by the inability to provide a viable means of viewing the stored images, specifically the DICOM RT objects so important to oncology. “So we set out to find solutions to store this type of record. Often, you might find a facility that can store the record but has no viewing capability, which is the main driving point for creating an oncology-specific solution,” says Nell. In addition, Varian predicts that oncology departments will see exponential growth in the size, complexity, and volume of images generated over the next several years, attributable to the success of image-guided radiation therapy (IGRT). So while facilities may have an oncology information system that manages information and images geared toward that workflow, these products are not constructed for long-term or high-capacity storage. Varian tried to design a system to handle the greater volume of images needed for advanced forms of therapy to enable facilities to be on the forefront of technology. Because technology advances so rapidly, Nell says that having an oncology PACS can give facilities the peace of mind that their PACS will be capable of storing images in the latest formats. “Storability and scalability are key, along with combining the enhanced viewing capabilities not available on stand-alone PACS,” he says. Nell says it is important that a facility’s RIS interface with the oncology PACS. Varian has designed its system to interface with any system using the industry standard Health Level Seven or DICOM protocol, which enables seamless scalability. Thus far, Nell has found that the roadblocks for facilities adopting oncology PACS are minimal. “Some facilities are hesitating to archive information. Customers like to have everything online, so Varian is working to provide equivalent reporting tools for archiving,” he says. In addition, depending on the type of system a facility currently has, an initial obstacle with workflow could be encountered if there are several manual import/export steps in the set-up of the oncology PACS system. “If integration is seamless, and if the information the user is viewing is transparent, that makes it much easier. Automation is the key to a seamless, transparent implementation,” says Nell. “Oncology PACS gives a longitudinal patient record. A physician can look at five to 10 years in time and bring it to the current place. It enables the oncologist to have information at his fingertips and make better, more informed decisions on behalf of the patient. Rather than accessing one encounter, it provides a clinical story line for the oncologist,” adds Nell.